Another day, another meatball. I made 30 little “Afghan-Style Pumpkin Turkey Meatballs with Yogurt Mint Sauce,” from The Perfect Pantry. 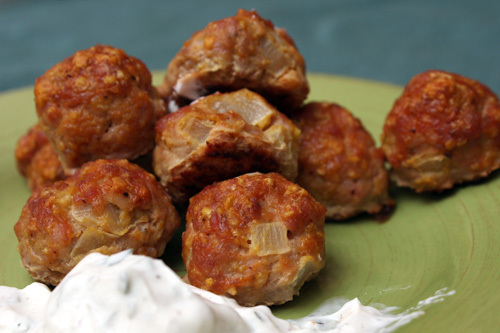 I find baking meatballs is appealing, because it takes away the “frying stress.” I added 4 oz. ground chicken to my ground turkey, being resourceful with what was in my freezer. Softening the chopped onion in the microwave before incorporating it into the meatballs was brilliant, I think. I was happy to include some canned pumpkin in this mix, though I left out the chile pepper (to keep the balls kid-friendly). I baked the meatballs for 30 minutes, until lightly brown. They were warmly flavored, thanks to the fresh ginger and ground turmeric. The yogurt sauce was nice and minty. These meatballs were kid-approved. I just can’t get enough of the bounty of winter squash available right now. The rainbow of options is dazzling. 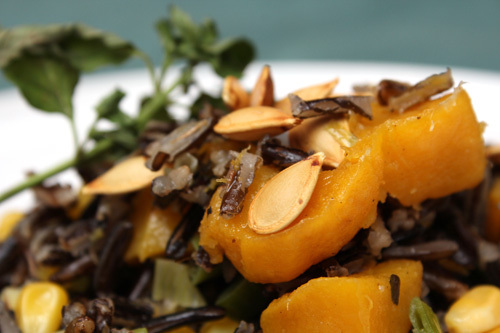 I picked out a pretty acorn squash to make the “Wild Rice and Acorn Squash Salad,” from Macheesmo. My wild rice cooked in 43 minutes, smelling fruity as it simmered. I roasted my cubed squash for 40 minutes, until slightly charred. I also roasted the seeds for 20 minutes, to include them as an appropriate garnish for the final dish. The recipe asks for a finish of chopped parsley, but I used fresh mint instead, since I was using mint in the meatball sauce recipe above. The mint was a good addition, here. Wild rice tastes nutty and is fun to eat. Try this one. Next time, I’ll cook the “Tom Kha Gai (Chicken Coconut Soup),” from the September 2013 issue of Bön Appetit. I’ll also indulge in some more winter squash, with the “Roasted Shallot, Squash, Grape, and Green Bean Salad,” from the September 2012 issue of Vegetarian Times. Woohoo! Come back to my site next week, to see my meal.